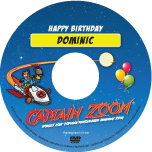 Burn your own Captain Zoom CD - NEW! 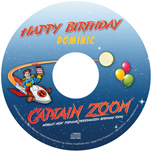 Add the CD Label and Sleeve Kit to your MP3 purchase and receive an official Captain Zoom personalized CD label and protective sleeve. Using your own blank CD, simply burn the MP3 birthday song, apply the personalized label and insert into the sleeve. A thoughtful gift for the special person in your life. The label and sleeve are shipped via prepaid first class mail.